Don't like those NW winds in coral sea. Must be hot on qld coast today. Kelvin wave is clearly progressing and warm subsurface anomalies are now moving out of the west Pacific and into the Central Pacific. The rains will come and when they do, we will be praying for it to stop, it's been six years since the last big wet and we also had the strongest El Nino on record in that time, sooner or later the pattern will swing the other way. So I suppose you think the big picture is the good rainfall in parts of Victoria and NSW last month, or the thousand kilometers of storms yesterday and not the poor rainfall figures for all of Eastern Australia over the last four months. Again, factually incorrect and a gross misleading overstatement. Apologies for the double post but could this Kelvin Wave if there is one actually strengthen the current La Nina because doesn't the subsurface cool once a Kelvin Wave has passed and a Rossby Wave comes back across the Pacific? GFS is still predicting a beauty of a trade burst. yes, it does - equal and opposite reaction. That's the thing the OP never tells anyone. Always one side of the story. 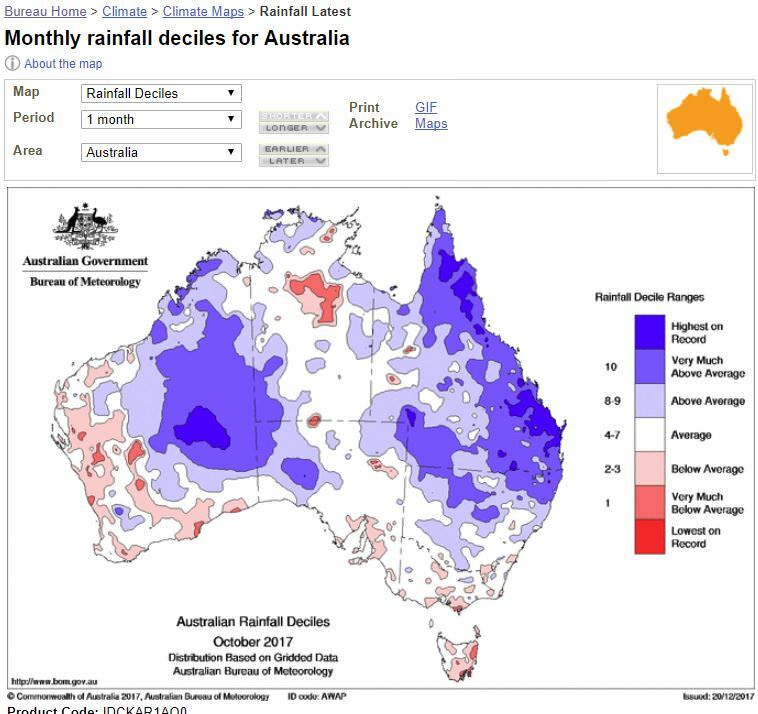 Where are these "poor rainfall figures over the last 4 months" again? ...and that is how I will note his contribution for the entire 2017 calendar year. The first to accuse others of nitpicking data but has clearly done so himself. Not to mention the 365 day obsession with warming from WWB's that simply did not eventuate whilst ignoring all the evidence put before him. Off to a great start for doing exactly the same in 2018 it seems. It is not going to be a major achievement forecasting the possible propagation of warm water from the subsurface in the west to the surface in the east. It has been happening for thousands of years and simply serves to highlight his contempt for other contributors in the thread. I listened to a story on the ABC (Simon Lewis from BoM) this morning suggesting that storms are likely to continue in Eastern Australia this Summer due to high levels of humidity, particularly in the NSW /Southern Queensland cnr . To ignore the contribution from La Nina is pure ignorance. The blocking ridging pattern that became established for much of December does NOT serve in any way to dismantle that fact and it had nothing to do with an ElNino. Not a thing. ElNino typically means a lack of humidity but then the more knowledgeable contributors (and there are many more than just 1) already know this. 2011 LaNina obs. laNina not going to have much impact if not strong. BoM already said as much. "La Niña typically brings above average rainfall to eastern Australia during summer, particularly in northern New South Wales and Queensland. However, with a weak event expected, this typically means less influence upon Australian rainfall. La Niña events can also increase the likelihood of prolonged warm spells for southeast Australia." The impact was strongest as it ramped up. It is the suggestion that it won't have any that I find disturbing when the evidence already debunks that. It is the suggestion that it won't have any that I find disturbing when the evidence already debunks that. What evidence? That some places have had above average and others haven't as shown by the decile maps? That the totals for all of eastern Australia end up below average? My forecast is for below average rainfall is speculation based on research I have posted before showing that the key areas that need to cool for La Nina to impact rainfall are further west than have cooled. The forecast from BOM for rainfall is for above average rainfall and that is good and fine. If you find that disturbing that is your problem not mine. I see the cherry picking continues. Why do you only chose Eastern Aus Mike? Is it because it filters out the good southern and northern values; which are also affected by ENSO? Because ENSO causes increased rainfall in eastern Australia. The best southern rainfall was in Victoria so included in East Australia. Best northern rainfall was in Western Australia, and rainfall in that region is frequently opposite to ENSO regions, so should be filtered out. I have been reading this thread for quite some time now. It's always a good read so keep it up ladies and gentlemen. I just wanted to post this short article I found quite interesting regarding the current and previous La Nina conditions. Arguably NT and SA could be added into the Eastern Australian figures. NT was about 10mm below average, and SA about 10mm above average for the 4 months, so not going to make much difference. I'm surprised they are only researching this now. RWM and I discussed the water east of PNG and its affect on Eastern Australia a few years back . Thanks for sharing the link. The BoM doesn't qualify on their site what constitutes 'eastern' 'northern' 'southern' nor 'western' so how do you know what is or is not included? Thanks for the link.....would explain a lot about this current Ninas performance so far.